Act 21 finished with the quests out of Sylvanaar. Act 22 features the rest of the zone. The first four scenes are out of Toshley's Station, and the rest is from Evergrove. You should be in Toshley's Station with all the quests out of the gnome outpost. You did one Test Flight earlier. It's time to hop on the machine for #2. You'll be asked to sign a waiver this time. The test flight should send you over top of Death's Door and land you just barely on the ridge behind it, but like all things engineering, it does sometimes fail. Hopefully you won't need to use the spirit healer. Follow clockwise around from Scalewing Shelf to Singing Ridge. The Singing Ridge consists of Netherdrake nesting grounds, and the crystal flayers that...well, I'm not really sure what they do, but they're all around the eggs. Open up the eggs one at a time, and zap the drake that hatches. Kill whatever it turns into. If you already have 3 of that particular type at that point, zap it again before you finish it off. Oh yeah, kill 10 drakes as well. Then head back to Toshley's. As a follow-up to Crystal Clear, return to the Singing Ridge. You only need to be within the area, so just inside it is fine. Clear out a space to work within, and then drop oscillators to "gauge the resonant frequency." This means you'll need to drop 5 thingies in a tight pentagon, and then stand in the center. (Math geek note: a perfect pentagon would have the oscillators 72 degrees apart, so you want to be just a little farther apart than perfect right angles.) If you have a big minus-sign debuff, you're too close to another one, so move away until it fades. Occasionally when you drop one, a mob will spawn. You have 3.50 minutes according to the oscillator tooltip, but this shouldn't be too much of an issue if you clear the area you're working in first. Remember that you have to stand in the center after you've got 5 oscillators up. One of the irritating things about Toshley's Station quests is that the quests come in tiers, and you have to finish each tier to advance to the next one. We have one last quest on this first wave of quests. Leave the station up the road to the north for Bladespire Outpost. On the ground around the outpost will be several small canisters. Activate them when the area is clear, zap the "electromental" that spawns with the quest item you were given, and then kill it. Five of them will do, and then back to Toshley's for new quests. Spiders -- They all stealth and used to be incredibly quick. They strictly hang out near rock formations and lie in wait. You need 10. Once you have them, they're fairly easy to avoid if you remember where they hide. Raptors -- There are a decent number of raptors, but the drop rate on their teeth is pretty bad, and you'll probably need to kill a slew of them. Snakes -- If ever there were a quest for healers, this is it. Non-healing classes might opt to completely ignore this quest because of the raw punishment they need to take in order to finish it. It's actually rather ridiculous to take TWENTY-FIVE lightning strikes. You're lucky to survive 3 or 4 per battle. *IF* you do this quest, and it's understandable that you might choose not to, activate your Repolarized Magneto Sphere and aggro a wind serpent. Beat it to an inch of its life, and then let it do the same to you before you finish it off. You want it to use as many lightning strikes as you can take with each fight, and then recover to full health afterwards. Expect to repeat this process 8 or 9 times, which is simply awful. Maggoc -- the "watch out" part of this one should be self-explanatory. First, you need to catch the little *purple* floating orb things. The trick to completing this quest is to find where some spawn, clear the area, and constantly lay down your catcher-device-thingy. However, that can be done while working on the other objective, which can take far longer. Amidst the ethereal are fleshbeasts. You need to kill them until you can get 5 pieces of flesh. The drop rate isn't wonderful considering the amount of work it often is to get to them. Be careful fighting to and around everything in Razaan's Landing. Patrols and tight quarters can make this area uncomfortable. Feel free to drop your Ghostbuster trap as you move. Go back to Toshley's to complete your quests and do the last teleport quest to send you to Ruuan Wield. Note that you actually have to do something during the flight! At flight's end, you will be in Evergrove where you can get the last flight point, set your hearthstone anew, and pick up some new quests. Evergrove is surrounded by arakkoa to the northeast and poacher camps to the west and north. Go toward the poacher camps (carefully!) and look for Overseer Nuuar to negotiate with. He's the only non-hostile, and patrols between all of the camps. Talk to him, and then return to Evergrove. If you have trouble finding the Overseer, clear out one of the camps and wait for him. Now start a circuit of the glade, beginning in the northeast with Veil Ruuan. Kill birds until you have six claws. Then clear the pond with the basilisks and summon Harbinger of the Raven in the center to get the pendant. After that, make your way around the area looking for Poachers and Hewers. Poachers are *much* easier to find, and the drop rate on nets is decent, so focus on finding hewers. They're most abundant at the actual camps. Chances are, while killing hewers, you'll also get a "Meeting Note" for a fourth quest on this short circuit you are running. If you do not, stay out in the field until you do, because that note is important to future quests. Return to Evergrove to turn everything in. Leave Ruuan Weald by its northern road. As you enter the chasm, you should be right in front of Bloodmaul Camp. Fight your way in, kill some Maulers (and some Warlocks,) go to the top of the main building to kill and loot Dorgok, and then kill some Maulers (and some Warlocks) on the way out. Thanks to the quest item Dorgok drops, you get three quests for the price of two! Quests completed: Into the Churning Gulch, Goodnight, Gronn, It's a Trap! Go head back out into the chasm and toward the Circle of Blood. (It's southwest of Evergrove, right where Dragon's End meets the main canyon.) You'll find Baron Sablemane outside, who will asks you to help him before he helps you help the Alliance guys. Just to the west is the Churning Gulch where you will find the crust bursters you need to kill. The drop rate ain't great, (I estimated about 25%,) so exercise some patience. Report back to the Baron for the follow-up. Grulloc is at the end of the ravine to the east of the arena, Cursed Hollow. Inch close to him, clicking on your sleeping powder as you move closer until it takes, and then sprint for his bag, grab it and move back out. 30 seconds is just long enough to get the bag and get out of combat again. If you're very lucky, there might be a group of level 70s killing him for another quest and you can just nab the bag. Back to the Baron, and then Evergrove. It's time to deal with those irksome cultists again. Head across the Wyrmskull Bridge and talk to Watcher Moonshade. Then head into the tunnel and fight your way up to Draaca Longtail and kill her. Return and you'll be sent out on another mission. Mount up and ride through the tunnel following the upper ridges. There are numerous quests to tackle in Raven's Wood. We will be making two trips to this area, so we aren't worried about hitting it all right now. There is just one quest that has a follow-up that we want to snag for now so we're ready on the next pass. 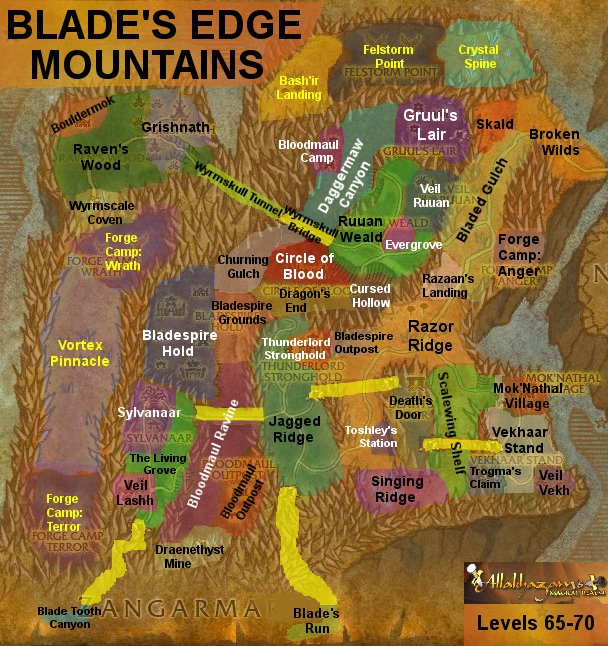 The area in the northeast is called Grishnath, home to a Veil of arakkoa. Kill a couple until you get an orb that starts a quest. The other quest in the area can wait. Follow the road to the west end of Raven's Wood where the cultist lair is, and fight cultists to get scraps for your costume. Be very careful in this area and only pick off the targets you can get easily, or you might get overwhelmed. In particular, if a cultist kneels down and prays, stun or interrupt them or they will almost fully heal and become a powerful wyrm. Your goal is to collect costume scraps for an overseer's costume. It takes 5 scraps, so I recommend you actually collect 10. This may sound like strange advice, but even if you don't use the spare costume now, it makes things easier later. Use your costume and enter the coven. Snake around the right side of the cave and you will meet up with Kolphis Darkscale. Talk to him, and then net the various whelps beyond him. Don't go too far. Hearth out when you are done. Keep your spare costume. Quests completed: Treebole Must Know, Whispers of the Raven God (maybe), Exorcising the Trees, Gorgrom the Dragon-Eater, Slaughter at Boulder'mok, Maxnar Must Die! Go back out to Raven's Wood. We have a few potential objectives here. Find Treebole to begin with, and then head into Grishnath. There are two related quests here, one of which is Whispers of the Raven God, a quest that I do not recommend bothering with. Focus on grabbing the five orbs for Treebole's quest. The orbs are groundspawns throughout Grishnath, especially in the treetops. If you do insist on doing Whispers, the best path to take is to head to the left side of the pond with the basilisks, toward where two rope bridges meet. Be VERY careful in this area as there are tons of patrols here. The third prophecy is at the back of the pond, and the first and second prophecies are up those bridges. Do the one on the left first. When you receive the second prophecy, the fourth will just be a little bit to the west and should appear on your radar if you have Understanding Ravenspeech, the buff you get from being near arakkoa as they die. You do -NOT- need to go into the central tree; this only leads to a chest. The biggest problem many players have with the quest, aside from Grishnath patrols being unforgiving, is that they kill the arakkoa from range and do not receive Understanding Ravenspeech, which makes them unable to interact with the prophecies. Even if you are a hunter, run in to finish the target off. After Grishnath, walk around looking for random ravens to kill and combine for exorcism charms to use on leafbeards. Exorcise 5 leafbeards and then head back to Treebole to complete the quest. Head into the ogre area in the northwest, Boulder'mok, after that. Kill some ogres, get at least three totems, and then go to the altar and use it. He will die (don't worry) and you can use the totems around the corpse. Finish your kill count and move on to the cultist lair. The final task for this act is back in Wyrmscale Coven. You need to go all the way past where you were the last time. If you still have your costume, you can sneak past pretty much the entire place and go straight to the boss. Otherwise, you'll have to fight through, (or fight enough guys to make a new costume.) After you past Kolphis, there are the whelp eggs, and then two Wyrmcult Blessed that patrol here. This is the point where you should stop and clear if you came in with a disguise. After the two blessed, you will be ready to fight Maxnar. I wish I could say this is some epic fight from looking at him, but even though he can take a beating, he's nothing special. Kill him and hearth out. It's time to return to the upper ridges where the Toshley's quests were. Head up to Bladed Gulch. You want to kill a corrupter pair and some raptors and wind serpents for Culling the Wild en route to Skald, which is at the far north end of the road. The corrupters will also drop a Damaged Mask that leads to a series of annoying quests at the Forge Camp to the south. We're going to continue on to Skald, which is only slightly less annoying. Approach Skald from the center of the southern edge of the area and *carefully* clear your way northward. This area can get nasty if you rush. It's recommended that you should pull anything that looks like it maybe possibly could aggro you. In more or less the center of the area should be a patch of dirt. Get near it and plant seeds and you will find this is the "southern" of the three volcanic soils. The other two spots are due north of the southern one, but you have to take slight detours to actually reach them. No, you can't make that jump. When you've completed the quest at Skald, get back out to the road and run down it to the east and into Netherstorm. You should eventually reach the goblin town of Area 52. Get the flight point. Then return to Evergrove. In other words, you can drop all the old Blade's Edge quests you've got laying around and move on to Act 23. This page last modified 2009-02-26 15:33:50.